Can you guess which of the above four mushrooms is the poisonous one (answer immediately below)? Answer: There is no way you can successfully guess, intuit, or speculate about a mushroom's edibility. There are no tricks that reliably tell you if a particular mushroom is poisonous (i.e. heating a poisonous mushrooms and stirring it with a silver spoon will turn the spoon black). Each mushroom has to be studied on a case by care basis until you're certain of it's identification. You have to observe carefully and do your homework! So you can learn them, but you can't guess (and you can't learn them by looking at a few pictures on the internet). 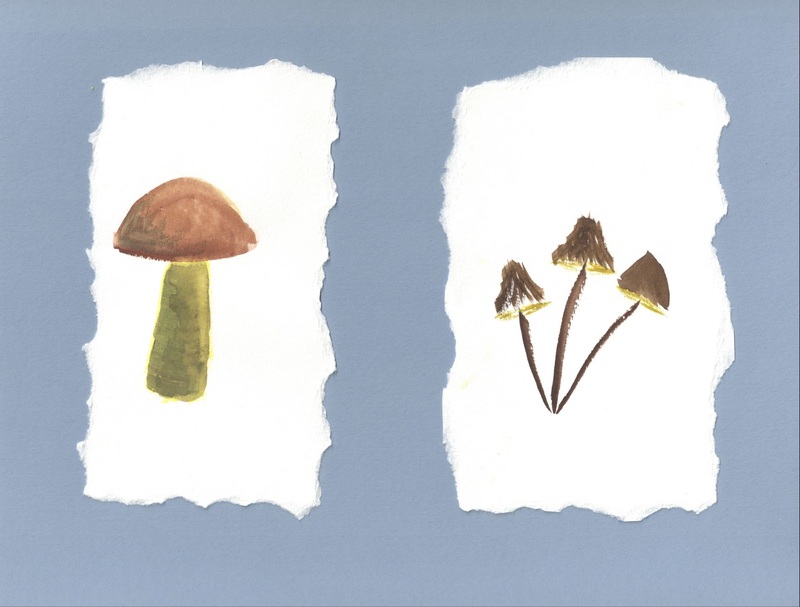 So I don't know which of the above four is the poisonous one, because in this case I didn't carefully observe the mushroom or do my homework (ok, honestly they are from my imagination). But the litlle ones on the lower left do look awfully suspicious . . . So can you touch poisonous mushrooms without getting poisoned (or can you touch unidentified mushrooms without worrying about getting poisoned)? Yes you can touch them; no mushrooms causes poisoning by touching them. you have to ingest them. However, that being said, you probably shouldn't touch unknown mushrooms and then put your fingers in your mouth, or let those that are prone to putting their fingers in their mouths touch unknown mushrooms, like little kids. However, that being said, last year, me and my two daughters, three and five years old, often picked mushrooms on hikes and on walks around the neighborhood (we got some interesting looks from people passing by who saw them with mushrooms, and saw their excitement with the mushrooms they had found). However, that being said, I've done my homework, and I am familiar with many poisonous mushrooms, and decide on a case by case basis if they can touch or pick. If I'm not sure, they don't touch it. The rule is that they don't touch a mushroom unless dad says it is OK. It might be over cautious, but they do put their fingers in their mouths at times. And finally, there are old mushroom hunters, and there are bold mushroom hunters, but there are no old, bold mushroom hunters. I handled some Chlorophyllum Molybdites (False Parasol) and experienced nausea and digestive upset for about 24 hours afterward. It was not psychological, because I did not know what they were at the time. So handling poisonous mushrooms can make you sick, at least a little. But not likely to unless you handle quite a few, and not sick enough to seriously inconvenience you (or kill you, which WOULD be a serious inconvenience). 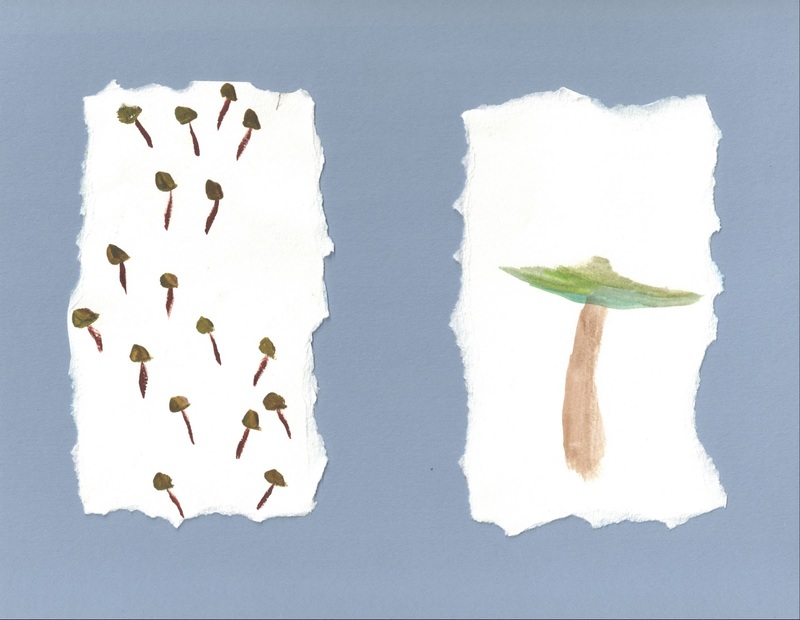 And I think your upper right image looks suspiciously Bolete-like, while the right one has a rather Marasmius-ish appearance. I agree that those little brown things on the lower left look suspicious - and I cannot ever recall having seen anything like the greenish one on the right, though somewhere in the background of that picture there MUST be a Chinaman looking for his hat. Thanks for the comment, and for reading the blog! 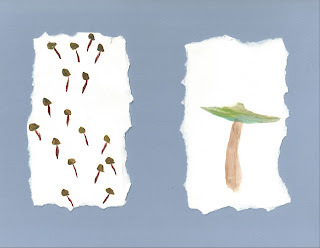 Looking back, I wonder what mushroom I might have been thinking of with the lower right one.